There was a time when death was handled in the home, and people took care of their family members' remains before the burial and cremation. In the early twentieth century, private funeral homes emerged where the remains were embalmed and laid out for viewings and services. Beginning in the early ninety's, there was a surge of corporate funeral homes. Please consider some of the reasons you might want to choose a family owned and operated funeral home over a larger, corporate one. Many corporate funeral homes rotate their staff from one facility to the next. A family owned funeral home is going to be able to offer you consistent and personal service from beginning to end. When you are grieving, it is far easier to deal with the same people through the whole process rather than someone different every time you turn around. Knowing we will treat your loved one with the upmost care and respect is a relief and one less thing for you to worry about. 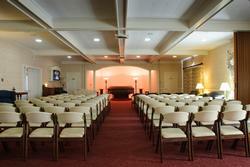 Our facility in North East has been a funeral home since the early 1850's. Crouch Funeral Home, P.A., has been a part of the community for generations. When you are planning for your loved ones and thinking about how to best honor them, please remember you have choices. Understanding how different funeral homes conduct services and treat their families is very important. When you want to feel as if your loved one's death and life matter and that the funeral home is doing everything it can to personalize the service especially for your loved one, choose a family owned funeral home.